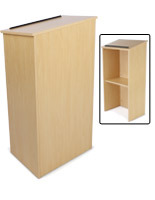 This floor podium is budget friendly with a simple and functional design. 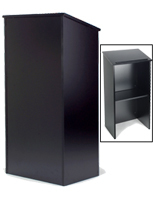 The generous reading surface on these stand-up lecterns can accommodate a 3-ring binder or textbook. 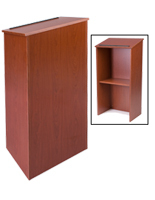 Inside this floor podium is a static shelf that provides space for additional storage and personal items during a lecture. 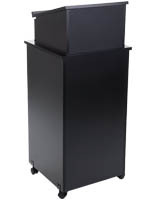 To allow for relocation while on smooth flooring there are 4 adjustable plastic glides (feet) included with these lecterns. 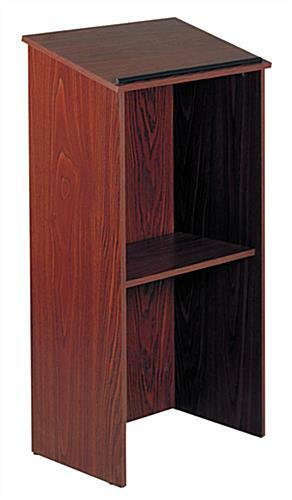 This floor podium comes in a natural mahogany wood looking laminate. These popular office finishes are sure to match most training and conference rooms. 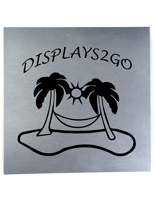 Use this floor podium in a restaurant to provide a central location for guests to add their name to a waiting list. 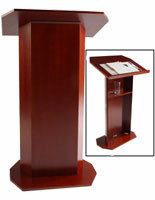 This podium can also be used in a small meeting room or church. The uses for this floor podium are practically endless. The reading surface is at a 15° angle and has a 1" book stop with a rounded edge to keep your presentation aids in place while speaking. 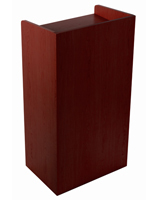 This floor podium is made of stain & scratch resistant laminate on 3/4" MDF. Medium density fiberboard is a modern furniture building material that has no knots or wood grain, for a smooth and flat substrate that is ideal for laminate to be adhered to. 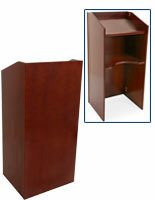 This floor podium, a laminate veneer lectern, requires some minor assembly prior to use. 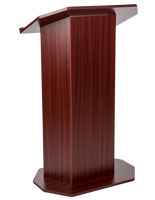 On person can easily put this podium together in a matter of a few minutes. The unit consists of 5 wood panels and all of the necessary hardware.